Should we Muslims seek to make this country more hospitable and secure for ourselves and for our future generations or, should we continue to remain disengaged and isolated from the aspects of governance that surround us? There is a law in Physics that says Nature abhors a vacuum; as soon as pressure reduces in one place, matter moves from denser locations to fill the vacuum being produced. This is just as true for Nature as it is for the social lives of humans. As Muslims remain aloof and disengaged from the society around us, our enemies move in to fill society with disinformation about Muslims and Islam until growing aspects of life are filled with the mythology against us, rather that the truth about us. There are strong, well-funded right wing organizations that live to promote hate against us and trade in images of an existential threat to them from us, to create fear and hate against Islam and Muslims. This is not a passive feeling that might go away or, that may remain, but it will not affect us. No, this is an active sentiment and the “knowledge” imbedded against Islam and Muslims creates the foundation for actions against us; actions that limit our freedoms, actions that target Muslims as the suspects, actions that profile us as terrorists and provide the excuses needed to target and attack us…actions that limit our growth in the country of our choice and for many, the country of their birth…OUR country. The vacuum is being filled by Right-wing Jewish and Christian groups and individuals who could not survive a week unless they have the flow of money that comes from creating and promoting an existential fear among sincere people of good will. Muslims need to look around. Entire segments of governance are being trained to believe Muslims are the greatest threat to the US and to the “Judeo-Christian Civilization”. The Police, FBI, CIA, ATF, ICE and even the military are being steeped with the “knowledge” that Islam is the machine that turns normal people into a monolithic, single-minded, murderous animals (Muslims). In Congress, Representatives and Senators are being exposed to calumnious films against Islam and Muslims, hosted and promoted by their fellow members. In many Churches and Synagogues, Priests, Pastors and Rabbis are energetically promoting fear and hate of Islam and Muslims. In schools, teachers are teaching from books that promote fear and suspicion against Islam and Muslims, starting at elementary school levels and going to High schools. Laws are being passed against us, limiting the way we may dress (France), the way our religious buildings should look like (Switzerland) and even the way our faith can be practiced. At best, Muslims can expect to live their lives here, under benign suspicion. At worst, many of us will experience harassment or even imprisonment, just because we are Muslim. 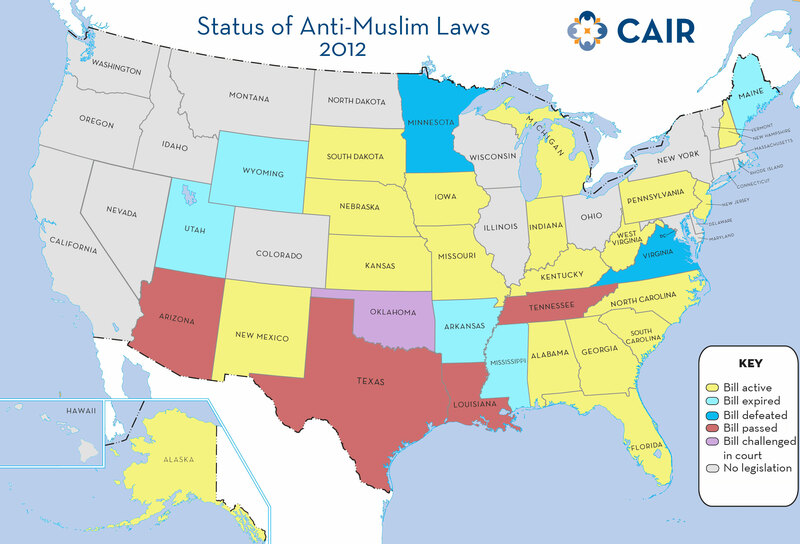 According to CAIR, as of this writing, thirty states have gone through the motions of anti-Shariah laws, they are considering bringing in such laws, they have tried and failed to impose such laws or, they have actually passed such laws (see map below); the numbers are growing. Our federal government has passed laws like the USA PATRIOT Act, the NDAA and more, which leaves lives of Muslims to the mercies of officials who are inclined to treat us almost as non-humans and threats to the US…and they are growing in their numbers. All this propaganda is having a deep, lasting effect on sincere Americans; good people who only wish to lead their lives in peace, people who love humanity and love their country. These people are being told that Muslims intend to destroy their way of life, that we intend to change America into a country with bizarre customs that will oppress everyone, especially women. Small wonder that so many people are stridently against Islam and Muslims in any form at all…the “infection” from Islam might spread! The vacuum of knowledge about Islam and Muslims is being filled by opportunists to the point where hate groups have grown to unbelievable levels; hate groups that target, Blacks, Jews, Hispanics…and increasingly, Muslims! Muslims have to put a stop to all this or we will cease to exist! The only way we can affect the thinking and therefore, the actions of those who have so much influence over our lives, is to not leave their impressions about Islam and Muslims, to be made by the hate-Islam industry. Muslims MUST get involved. We need to make sure Muslims are working as Police officers, as members of the FBI, the CIA, the ATF and all the other alphabet soup of institutions that can destroy our lives at will. We need to be in the military, in politics as politicians and as interns…we need to be everywhere! Our presence will have two major effects. The first will be to cause the hate-groups to hesitate when they are targeting institutions for brainwashing…it is hard to train against Muslims if the audience includes Muslims! The second is to help those who will be working alongside us, to understand Muslims and Islam better by our example and by answering their questions about us…it is difficult to believe Muslims are a murderous group of single-minded people if your own colleague is a Muslim and he acts nothing like the hate-industry would like everyone to believe. No. Muslims do not have a choice in the matter; we MUST, MUST, MUST get engaged in every single aspect of life in the countries where we live…if we want to live in peace as equal in our country and wish for the same for our future generations. If you don’t like how my country treats your kind, get out of it. Go home – and don’t waste time claiming your home is America because America will NEVER be home to any Muslim because there is little, if anything, remaining in Islam that is compatible with America. Excellent analysis, diagnosis and cure. Fully agree. Wow, bravely spoken “Jonolan”, even if it is from an ignorant point of view! Obviously, your “knowledge” of Islam is limited to the bilge fed to your by hate-mongers. Just as obviously, you have taken no measures of your own, to investigate and verify the misinformation fed to you about us…probably because you are quite comfortable in your own pool of bigotry. It will be a futile exercise to try and educate you here so I will not do so. You should know that America is MY country just as much as it is yours. I suppose there is something good in the fact that bigots are also allowed to live here. You should know that we Muslims ARE here and we are going nowhere and yes, America will change because we are here, just as it changed when the White Man came here and the Black Man was brought here, and the Hispanics, and the Jews and the Chinese, the Japanese and all others…MUCH to the discomfort of the bigots of the day. If that makes you so uncomfortable that you cannot share this country with us, then you are welcome to buy a ticket and go wherever you will find a Bigots’ Haven. I dare say, America will be the better for it. Jeff, Speaking from the HolyRoman See, both you and the poster have much in common. We od the Roman Catholic Church, talk the talk and have walked the walk. There is only one true God. The rest is for children. Can Isam and the holy Roman Catholic church co exist? I will say, We detest the persecution of the protestants. We spit on Martin Luther,Hedons.and all Non-believers. We welcome War and Love from Islam. We love the Muslim,the Budhissts, the Hindu. Long before we welcomed the Arab and Persion, The American Protestant,wantonly abuse and lynched the Indian natives,the Immigrant Catholic,the Mormon,the jew and the African Black slave. Also,contrary to media lore. the knight of Templar had the fine honed steel that made decapitation as easy as slicing butter.